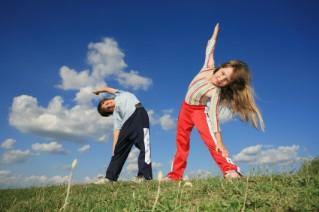 Have kids stretch before any gymnastic activities. Throw a gymnastics birthday party for your tumbling tykes. Gymnastics centers often have options to have birthday parties at their facilities. Your child will love the idea of having a party at the place where s/he plays with friends. It can make planning the birthday party easy on busy parents, as the center provides birthday party games and activities using the gym. All you will need to do is invite the kids and bring the cake! Most gyms will require that a signed parental consent or waiver form be returned with all children who are attending the party. This is for legal and safety reasons. When inviting children, be sure to emphasize the need for forms to be returned completely filled out. Additionally, let parents know that kids should be in athletic clothes with no jewelry. Gyms may have a limit on the age of children or the amount of children allowed on the floor at one time. You will also want to find out any instructions for setting up and taking down decorations and food. Go over everything with the scheduler when you set the appointment for the birthday party. A gymnastics-themed birthday party does not have to be held at a gymnastics center. Instead, host your own party at home. Create or send party invitations that let everyone know they should wear sporty clothes and come prepared for an afternoon of activity. Hosting the party at a local park provides plenty of obstacle-course opportunities. Kids can have monkey bar challenges such as who can hold on the longest, slide races and more. If children have a hard time calming down after all the activity, consider reading them a fictional book that revolves around gymnastics. Boing! and D.W. Flips! are both good choices for children under the age of eight. Finish the day with food and drinks while the birthday kid opens presents. Healthy finger foods, like carrot sticks and apple wedges, will balance a decorated birthday cake. The cake might feature an edible photo of your child doing gymnastics or a favorite piece of equipment such as the bars or vault. Keep your camera on hand throughout the day to capture all the memories from your child's gymnastics party. Print a photo of each guest in action at the party to include in a thank-you note. Gymnast Custom Banner: Customizable options ensure you get exactly what you want. Gymnastics Cupcake Toppers: Super cute circle cut-out cupcake toppers in pastel colors. Gymnastics Dinner Plates: There are lots of options in a variety of styles so you can match your supplies. Gymnastics Invitation: An invite with boys and girls, perfect for a preschooler or kindergartner. You can also make or buy a piñata for kids to break as part of the gymnastics birthday party fun. Make a medal shape and paint it gold, using red, white and blue streamers to hang it.